An easy but hugely rewarding walk from West Burton that includes lovely riverside walking, two waterfalls and some grand views from Morpeth Gate. Over the last six months I’ve increasingly enjoyed ‘discovering’ the waterfalls of the Yorkshire Dales. Many of these lie in areas that I hadn’t necessarily covered in my earlier walks in the Dales which tended to concentrate on hills rather than what was in the valleys. The aim of this walk therefore was to visit Redmire Force, one of the few named waterfalls on the River Ure in Wensleydale. Rather than choosing a more obvious starting point such as West Witton or Redmire itself I decided to start from West Burton, not only so that I could incorporate a bit of Bishopdale and Waldendale into the walk, but also so that I could finish at West Burton Falls. After a few largely cloudy walks I was grateful to arrive at West Burton to find the sun shining and plenty of blue sky overhead. It is amazing how such a change in the weather can really lift the spirits. Leaving West Burton I ambled across a few fields to Eshington Bridge before commencing a nice stretch of walking alongside Bishopdale Beck to Hestholme Bridge. Remarkably, this was the first time that I’d actually come across Bishopdale Beck on all my wanderings. Crossing carefully over Hestholme Bridge, which lies on the Leyburn to Hawes road, I continued on above the beck for a short distance until I dropped down to Froddle Dub where Bishopdale Beck flows into the Ure. Although the map shows the right of way skirting the outside of the woods where Froddle Dub is located there were good paths leading in and out of the wood so I guess access is allowed. At this point the blue sky was temporarily blocked by a passing snow shower. From Froddle Dub I commenced a fine section of walking alongside and above the River Ure passing along the way the stepping stones at Slapestone Wath. Eventually I reached the steps leading down to Redmire Force. A smaller, more modest version of Aysgarth Falls further upstream, Redmire Force was a lovely spot and as an added bonus I had it all to myself, something that can rarely be said by visitors to Aysgarth Falls. Leaving Redmire Force I crossed a few pastures to reach Back Lane which led me to Swinithwaite. Crossing the main road I took the short lived lane climbing out of the village before heading west to visit the sparse remains of the preceptory of the Knights Templar. Having briefly pondered on the fate of the once mighty crusading order of knights I joined a track that climbed up on to High Lane. Turning right on High Lane I followed the track south-west. 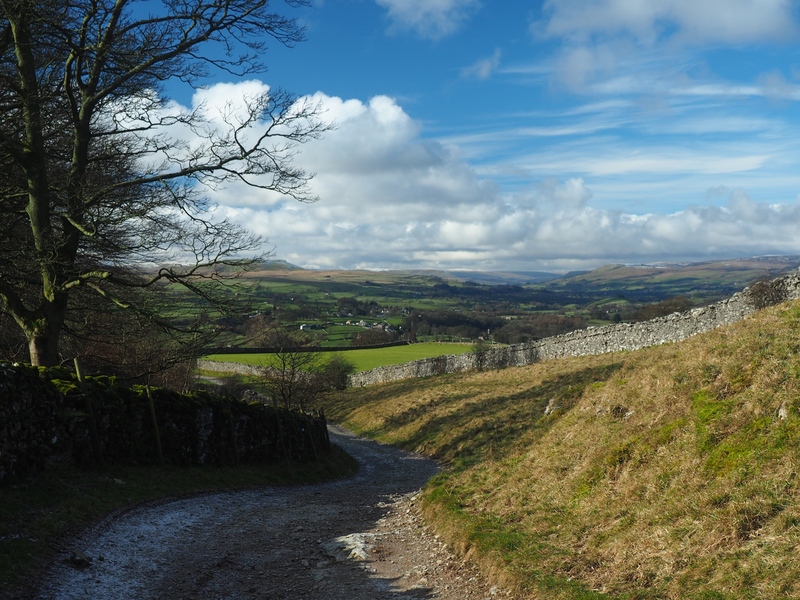 At some point it changes names to Morpeth Gate and as I continued I enjoyed increasingly grand views of Wensleydale, with Addlebrough in particular looking very fine. Coming to a fork I climbed up on to Morpeth Scar to enjoy a superb panorama of the valleys of Bishopdale, Waldendale and Wensleydale. Having sated my need to take dozens of photos I dropped back down to Morpeth Gate which led me all the way back to West Burton. This quite lovely outing was topped off by a visit to West Burton Falls, deservedly one of the most popular waterfalls in the Dales.